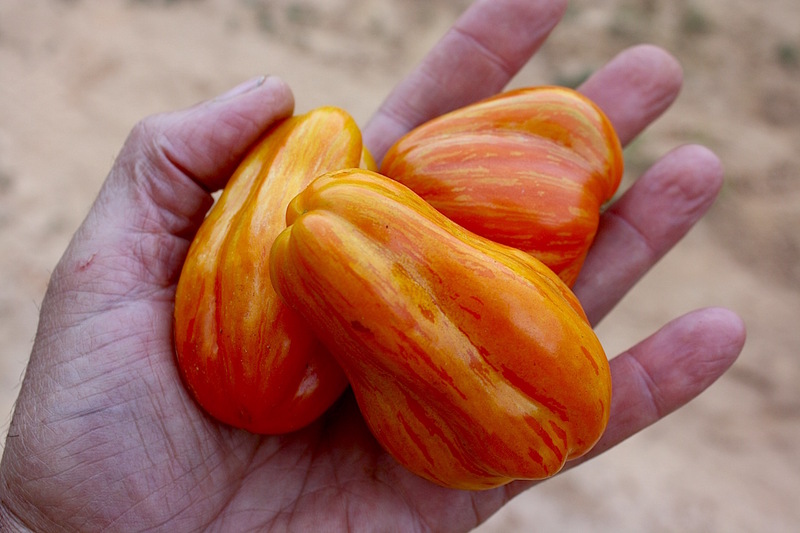 Foolad and Panthee (2012) give an excellent review of Marker Assisted Selection (MAS) in tomato breeding, providing more detail than intended here. 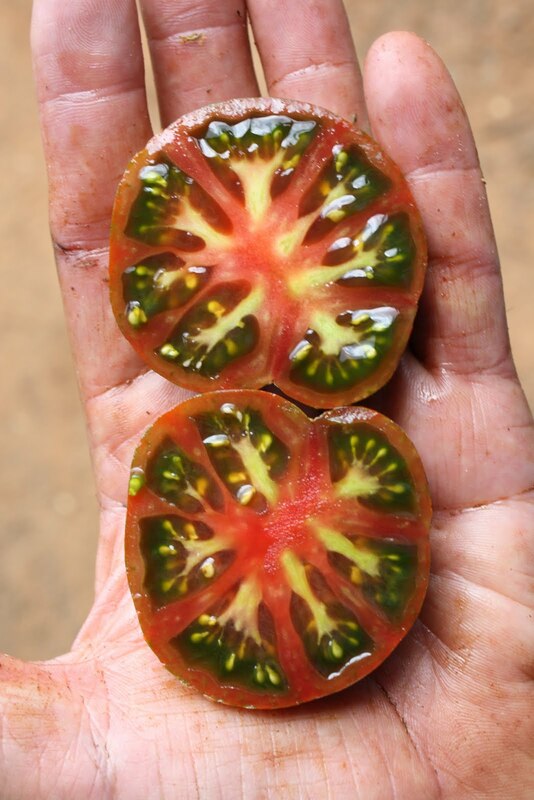 Our goal is to explain the basics and give examples of how this tool can be used by tomato breeders, and how we are employing the technology in our breeding program. There are various types of molecular markers that can be used in breeding (e.g. SNP, AFLP, SCAR, CAPS and SSR), but these all represent a short DNA sequence with a known physical location in the genome – essentially “mile markers” on the roadmap that defines structural characteristics of the plant DNA sequence. For example there are tens of thousands of SNP markers now placed on the physical map of the tomato genome. When one of these markers is adjacent to (or within) a gene of interest, such as a gene associated with resistance to a particular pathogen, the marker and the gene co-segregate – and selection for the marker is an effective surrogate for selection for the trait. PCR-based genotyping can be used to quickly confirm presence or absence of a particular molecular marker, and many markers are co-dominant enabling a determination of whether the plant contains one (heterozygous) or two (homozygous) copies of the marker. These assays are conducted on DNA extracted from a very small amount of plant tissue, and thus can be performed on very young seedlings. 1) The presence of the molecular marker can be confirmed at the seedling stage, and not reliant on a trait phenotype that is expressed several weeks later (e.g. 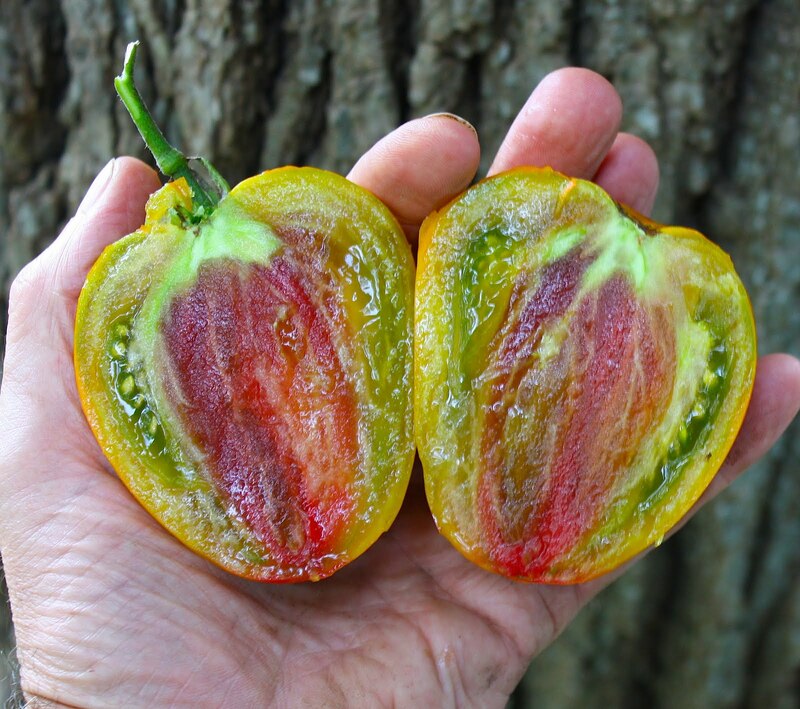 fruit color), or on a phenotype that is dependent on particular environmental conditions (e.g. disease resistance). Early selection allows early culling of undesirable plants based on genotype rather than phenotype. 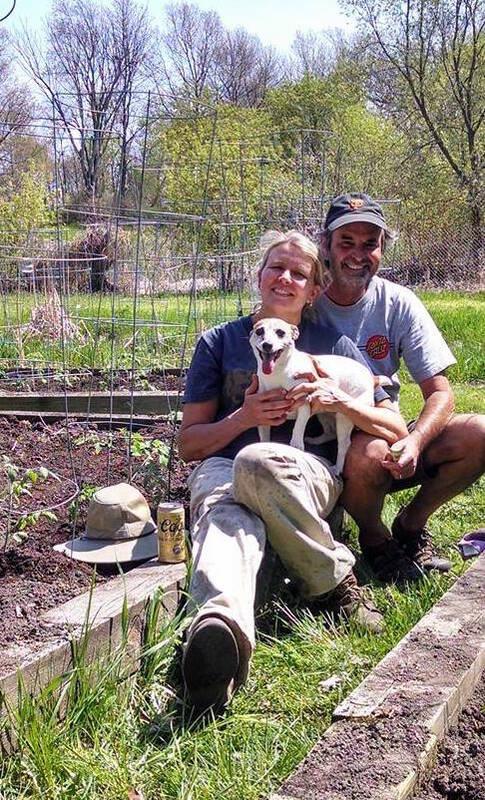 Early culling means that only those plants pre-selected for the desired trait or combination of traits go to field breeding nurseries or crossing programs. 2) Trait stacking is the breeding process for combining multiple desirable traits into a single breeding line. The first step always involves using crossing to bring the multiple traits into a single breeding population. The second step, greatly aided by MAS, is to identify low frequency plants in the breeding population that contain all the traits of interest. 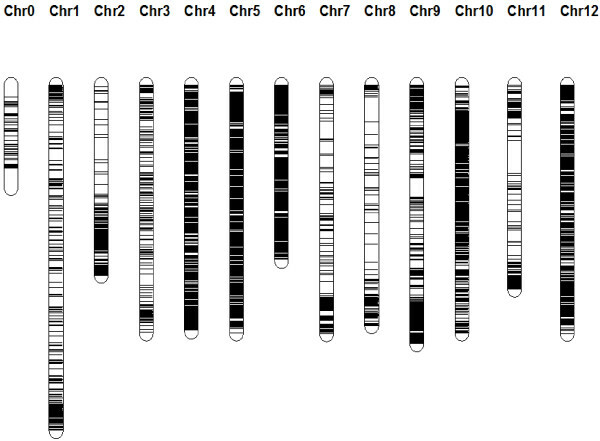 For example: the cross AABBCC x aabbcc, where genes A and B control resistance to two independent tomato pathogens (e.g. 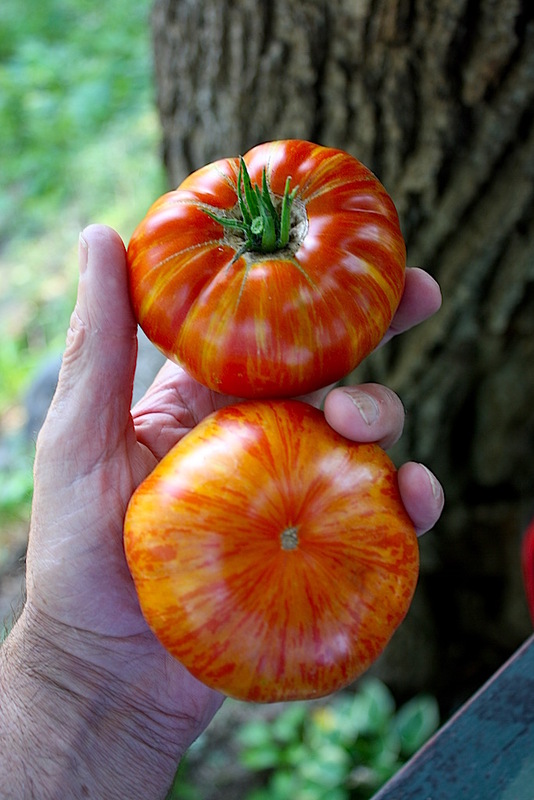 ToMV and LB) and resistance is dominant, and c is a desirable recessive allele for a trait for fruit color (e.g. ogc/crimson). The F1 progeny will all be AaBbCc and in the F2 only one plant in 64 will have the desired stable genotype AABBcc. Now think about stacking 7-8 genes (which we are) - MAS allows the efficient testing of hundreds of F2 progeny to find the “needles in the haystack” combing the desired traits. When stacking more than 3 traits it will likely be necessary to do this in a stepwise fashion. How is MAS being used today? Molecular markers have now been identified for many of the multiple genes associated with resistance to key tomato diseases and nematodes, and in some cases to the multiple races of the diseases now prevalent (e.g, all three races of Fusarium wilt). Commercial breeders have been successful at stacking resistance to most of these key pathogens in newer hybrids – with MAS being a critical tool in such stacking. 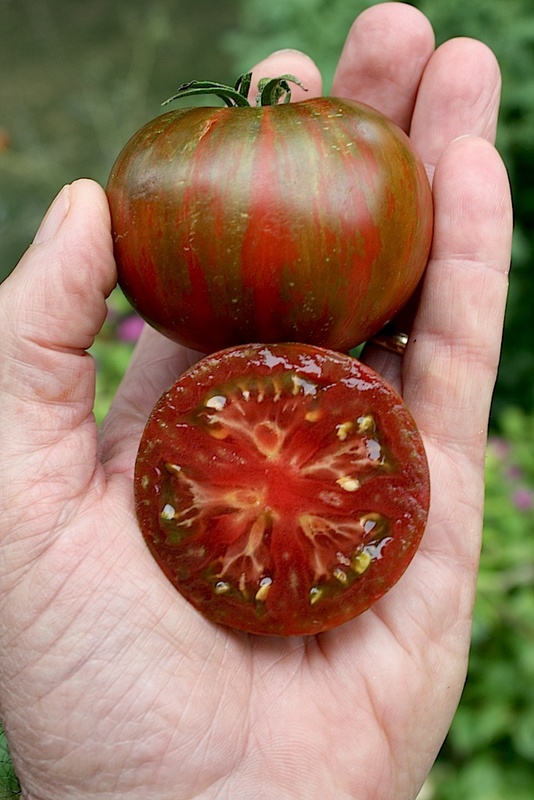 Molecular markers have also been identified for a handful of other major genes controlling important traits – but it is a short list: tomato fruit color - red vs yellow and crimson vs red; fruit size - locule number; plant type - determinant vs indeterminant; and presence of the rin allele associated with delayed ripening. 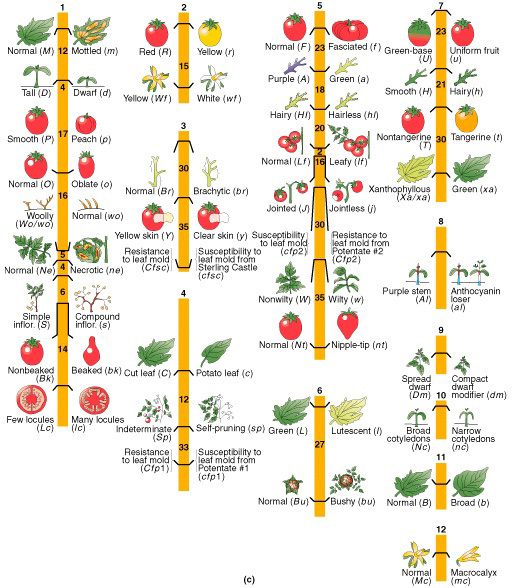 Some of the major genes controlling plant/fruit phenotype are shown below (photo courtesy of University of Newfoundland) - linked molecular markers are available for a few of these. All of the examples cited above involve major genes providing control of simply inherited traits. However we know that many important traits are quantitative traits, controlled by multiple genes – typically each with a small, but cumulative effect. Quantitative trait loci (QTL) are molecular markers associated with genes/alleles contributing to a quantitative trait – such a fruit yield, fruit size and fruit flavor. MAS allows the effective stacking of QTLs that in concert have a major impact on a “hard to breed for” quantitative traits. 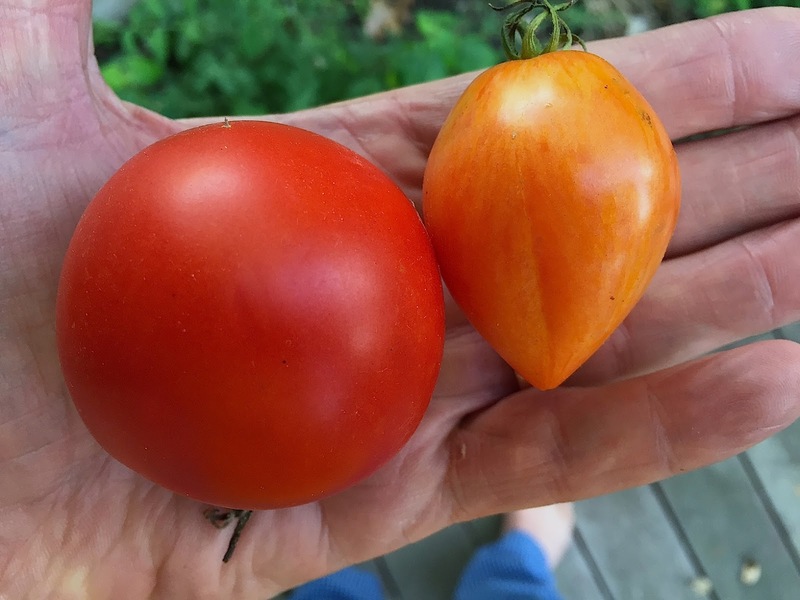 Harry Klee and his colleagues at the University of Florida have been working to unlock the mystery of flavor in tomatoes. What are the multiple components of flavor, how do they interact, and what is the genetic control of these factors? I am confident this will eventually lead to QTLs associated with key flavor components – facilitating breeding for better tasting tomatoes. University breeding programs and the larger commercial tomato breeding companies all have access to the tools required for MAS. Thankfully there are also a few commercial companies that conduct such activities on a fee for service basis, which allows the smaller players (FLF included) access to these tools. Such access is a significant incremental expense per se, but allows cost savings, and an accelerated timeline in the long run. 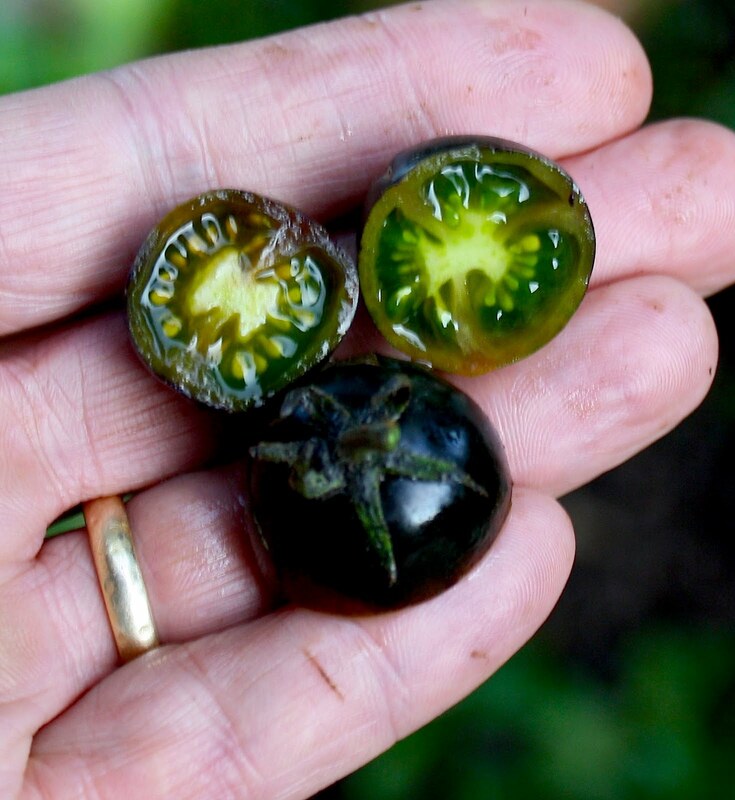 Our breeding program started with crosses between heirloom types with a primary goal to improve flavor and plant health. After a couple years we started crossing these to a handful of commercial types, including a couple of the NCSU hybrids, to introduce improved disease tolerance and improved fruit quality. We are now using molecular markers to identify progeny from these crosses which combine resistance to multiple pathogens – and will follow that genotypic selection with phenotypic selection for flavor and fruit quality in our various breeding nurseries. 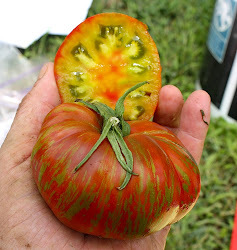 The use of molecular markers and our recent access to facilities allowing 3 breeding generations/yr should allow us to soon commercialize new F1 hybrids with state-of-the-art disease resistance, best-in-class heirloom flavor, and in a rainbow’s array of colors and stripes. MAS-enabled multiple disease resistant F4 - a F1 parent "in training"